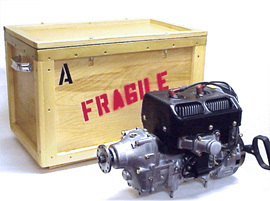 Want to send your engine to us for repairs but don't want to hassle with crating and shipping hassle?? Use our exclusive crating and pick-up service that basically does everything for you. We UPS one of our small fleet of specially designed super duty wooden shipping crates, you bolt your engine on the enclosed ¼" aluminum plate, drop it in our crate and with four wing nuts seal it up. Then CPS issues an electronic call tag to UPS instructing them to come to your address for a pick-up, the driver puts the label on the crate and sends it to CPS. After the repairs are completed the engine is returned to you in the same crate. CPS then issues a second electronic call tag and the crate is returned to CPS empty. Avoid the hassle of designing crates and waiting in line to ship your stuff by using our exclusive out and back shipping service. Our wooden crates are super tough - designed to withstand any package handling and shipping. Holds any two stroke with the gearbox attached in most cases.